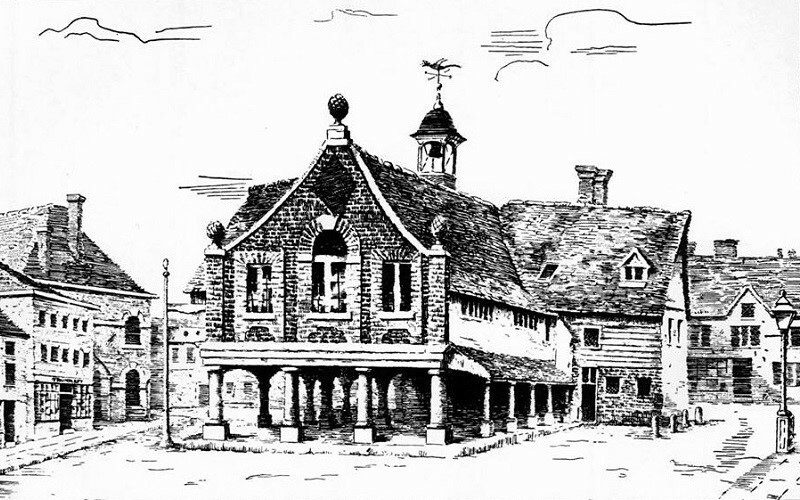 The old Guildhall, built in 1611 formerly occupied a considerable part of the Market Place in Newbury, it was a very picturesque building. A Court of Record was held in the Guildhall on a Tuesday every week throughout the year. The town mayor or one of the aldermen, would take cognizance of debts along with other matters happening within the borough, but not exceeding in value of £20. The Corporation was directed to appoint 'four honest and discreet men, learned in the law of this kingdom' to be attorneys of the court. 20th September 1643 At the First Battle of Newbury Lord Falkland served in the front rank of Lord Byron's regiment, and whilst gallantly charging the towards the Parliamentarian musketeers he received a fatal musket-shot in the stomach, and fell from his charging horse. 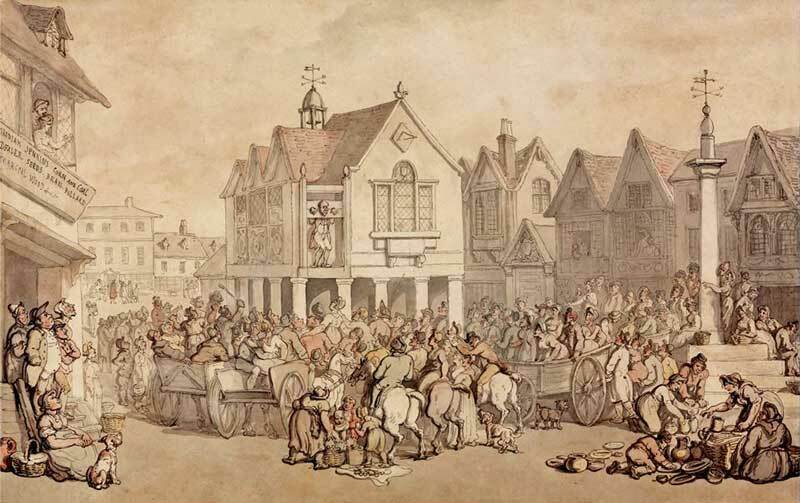 During the following morning, the body of Lord Falkland, Lord Carnarvon, Earl of Sunderland and other gallant Royalist officers were taken to the Guildhall and laid out so that friends and family could claim their bodies to be buried. The following day, Lord Falklands body was removed and taken to Great Tew in Oxfordshire, where he was interred in the chancel of the parish church of St. Michael. 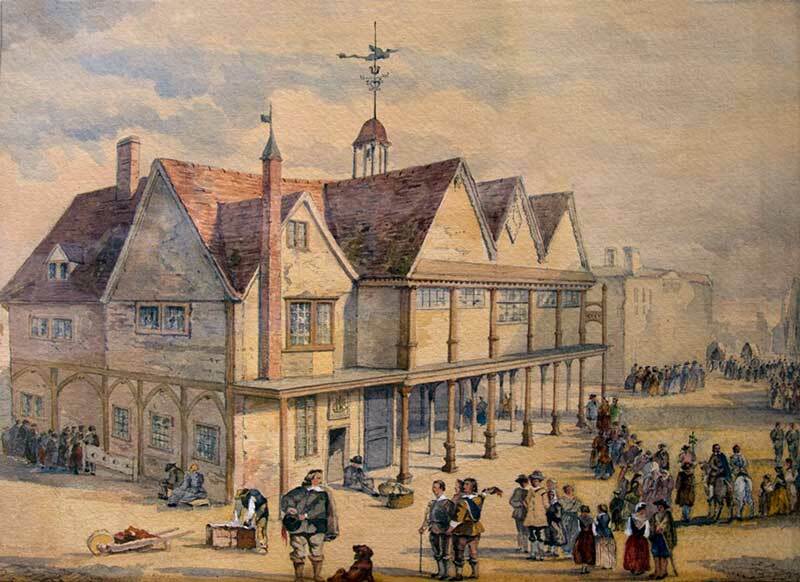 November 1683 At a meeting held at the Guildhall, it was agreed that a common prison should be built at the charge of the Corporation. 1684 A prison was built on the east side of the Guildhall, and consisted of two rooms and garretts over them at 27ft x 16ft and was set upon pillars as shown in the submitted building plans. The ground floor was principally occupied by butchers’ shambles, and by dealers in poultry, butter, and other commodities. The west front of the building was ‘beautified’ at the latter part of the reign of George II. The upper floor was approached from the paved area below by a spacious flight of stairs on the north-west side, contained the ancient Council Chamber, which was also used for the County and Borough Courts of Quarter Sessions, and for other public purposes. At the south-west angle the Pillory and Whipping Post were fixed, and at the north end were the Parish Stocks. The upper floor was reached by stairs from the pavement. 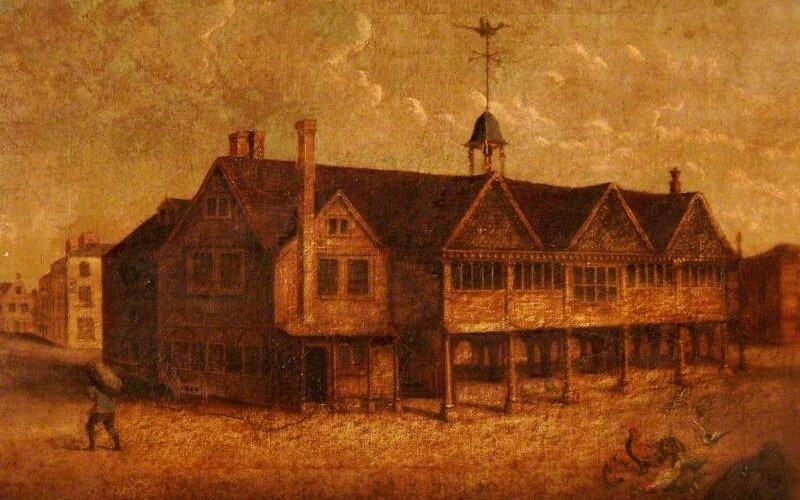 July 1684 At the Court held in the Guildhall, it was ordered that Sackvile Turner, Thomas Shepherd, Jonathan fifarding, John Bane, Thomas Howell, and John Tubb was sentenced to prison for rioting in Newbury. The grand jury convicted them of committing a riot, they were committed to the town prison, in the custody of John Dandridge, the keeper of the prison. The prisoners were subsequently discharged on the payment of a fine of 6s. 8d. each. 25th June 1685 At a meeting, it was agreed upon by the members of the Corporation, that upon the feast days of Christmas, Easter, and Whitsuntide, the Aldermen and chief Burgesses of the Borough will first meet in or under the Guildhall, and from there to the Mayor's house, and then attend him to the parish Church, and from thence home againe from Church to the Mayor's house, and meet again at the Mayor's house during the next morning after the three feast days, and then also accompany Mr. Mayor to Church from his house, taking first the accustomed entertainment. 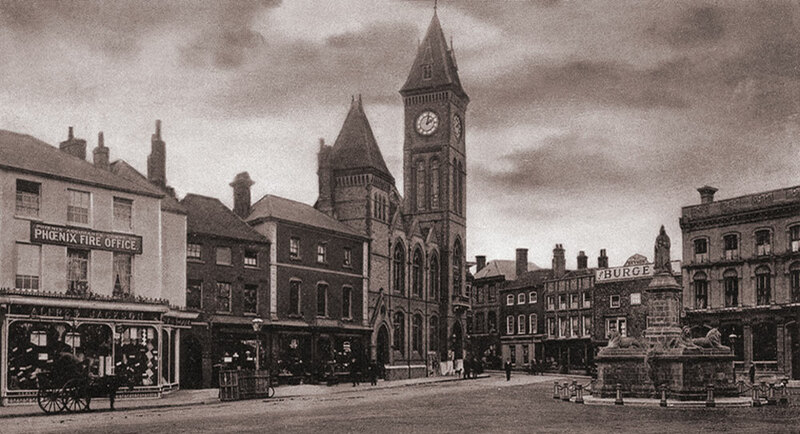 1686 A meeting was held at the Guildhall to recommend that the Market Cross required some repairs. 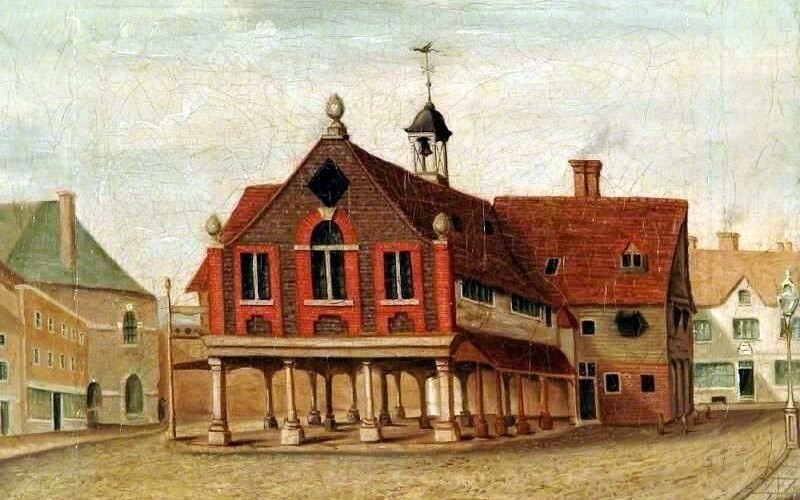 21st October 1695 The Corporation adopted a resolution that the ancient Market Cross, which stood at the south-west end of the Guildhall should be repaired, new stones was provided. 1725 The Guildhall and Market Cross is shown in Stukeley's plan of the town. 7th May 1754 Sarah Deacon was sentenced for giving birth to an illegitimate child, the punishment she received was to be held in the House of Correction for a month and every Friday to be publically whipped at the whipping post in the Market Place between the hours of two and three o'clock in the afternoon. The offence was for having an illegitimate child. January 1757 Ann Fisher was sentenced for feloniously stealing a leg of pork out of the Shop of Henry Fleet, Ann pleaded guilty to the crime and was ordered to be whipped during the next market day at the public whipping post. 1760 The Guildhall was extended. 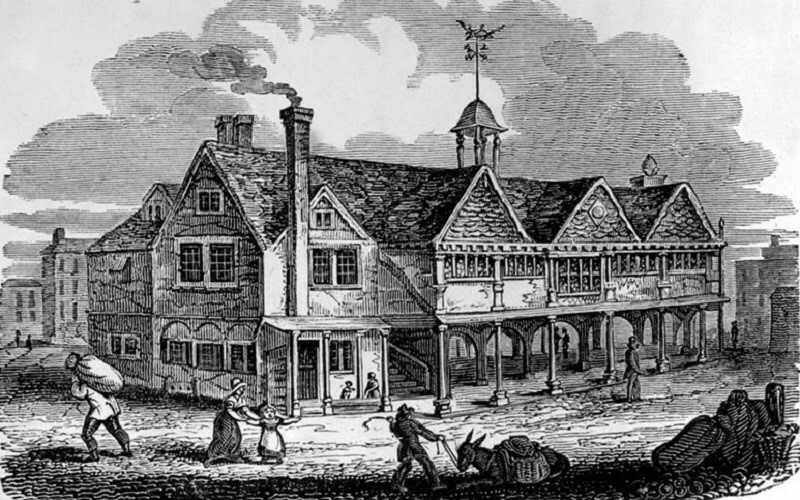 1828 In consequence of the old edifice having become dilapidated and considered an obstruction to the carriage-way to other parts of the Borough, the authorities under powers of the Newbury and Speenhamland Improvement Act of 1825, had the historic building razed to the ground, the beautiful carved internal fittings and highly enriched external ornaments were sold to the rich for a mere bagatelle. Among the projects proposed by the above Act (1825), were a new Town Hall, a new Gaol and House of Correction, widening of the Mansion House corner, and new street from Bartholomew Street to Cheap Street through the ‘Catherine Wheel’ yard, and various other improvements. 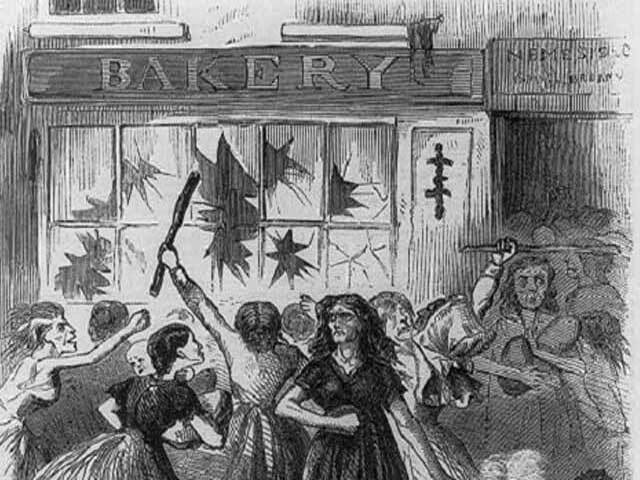 The Bread Riot started when people broke out into wild riot due to the high price of bread on Market Day during August 1766. 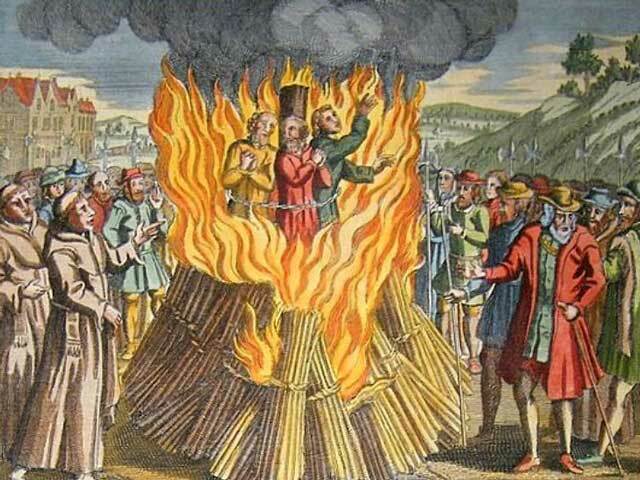 Joscelyn Palmer, Thomas Askew and John Gwin, known as the Newbury Martyrs burnt at the stake during 1556. 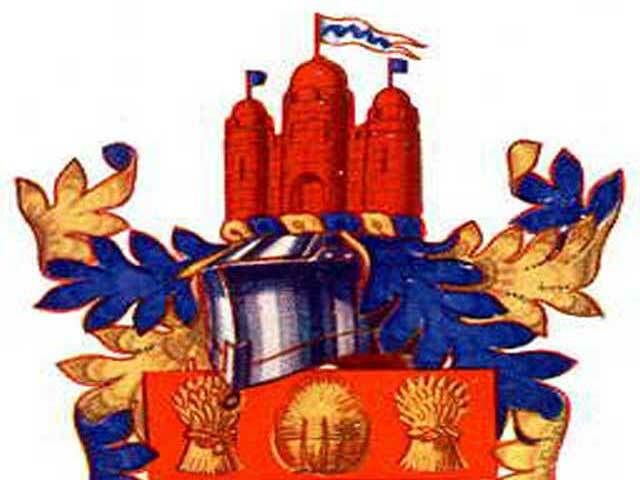 Newbury Coat of Arms were officially granted to Newbury Town Council in West Berkshire on 24th June 1948.